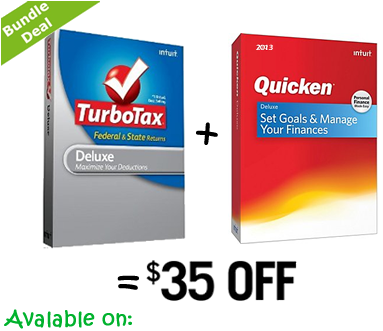 Due to the popular demand TurboTax and Quicken Bundle offer is back and saving you even more this year with $35.00 when you purchase two qualifying versions together. Once again, Intuit lets you try two of its flagship products to get better control of your financials. Every person’s goal should be to better understand and manage his/her own money and get the taxes done faster, receiving a refund in just days. Software’s objective is to help you get there easily and make the entire experience palatable and educational. What does Quicken have to offer? See all your accounts in one window for better understanding of your big picture. Decide how to categorize your expenses and see where your money is going. Set up savings or debt reduction plans; easily experiment how changing time and contributions affects reaching your goals. Create bill reminders and never miss a payment, avoid late payment fees. Manage cash flow – tell Quicken when a paycheck is coming and bills are due and it displays monthly inflows vs. outflows on a graph. Export your information to TurboTax and get a head start on your tax return. What does TurboTax have to offer? 100% accuracy in preparation of your tax return – guaranteed. Step-by-step guide through all sections of a tax return using interview-style questions. Searches for all possible tax deductions based on your situation. Up-to-date with Tax Law to make sure you receive all benefits you qualify for. Know your refund (or liability) at any time as it is displayed and updated with each answer you provide. Access to wide variety of help options to make sure you understand all steps. File your federal taxes electronically with free federal e-file and receive your refund in as little as 7 business days. There are also some unique business features that Quicken and TurboTax users enjoy. In Quicken, you can create invoices and estimates, pin together your personal and business accounts, as well as investments. TurboTax will search for all appropriate deductions to reflect your business activity and you can file your taxes reporting your personal and business activities together. It includes all the necessary forms businesses are responsible for filling out. It will even help you prepare W2s and/or 1099 for your employees. Both products include access to experts’ advice with whom you can chat to have your questions or doubts resolved. Many of the common questions are listed, just click on them to see the answers. There is also Live Community where users post and answer questions and share useful tips.